In this stretch we had more mountains, glorious views, and gruelling climbs... We are still in the Andes after all, and will be for the foreseeable future. We are now at the point where a 400 m (1,300 foot) climb is a small one...and we have embraced our new much smaller daily averages, as climbing up hills at 6-7 (and sometimes 5) kilometres an hour, slows progress a tad. But we carry on, it seems to be one of our only constants for the last ten months... Just pedalling forward. We are currently staying at a casa ciclista just west of Ecuador's capital city Quito, where Santiago Lara and his family have been taking in travelling cyclists for almost 20 years. Our plan is to rest here for a little while, catch our breath a little, and possibly take some Spanish lessons. But, truth be too it might be a little hard for us to stay put for too long ;). Ipiales to San Gabriel, Ecuador! Ipiales is only a few km from the border with Ecuador so the plan was to cross the border first thing, and then make it to the town of San Gabriel where we had a warm showers stay arranged. When we got to the border however, we were somewhat delayed. One of the things we have discovered an this bike trip is that we sometimes neglect to research things like entry requirements for different countries... I am not sure what it is about cycling for so long, but when travelling so slowly the political borders become a little less important then say, the mountains, the deserts or the next place to buy food. Anyways, we got to the border and as we were about to check out of Colombia some 'helpful' folks told us that we would need our Yellow Fever vaccination certificate to enter Ecuador. We pulled out our very old immunization records, and Glenn did not have any record of the vaccination, but knew that he had had it at some point...and I had the certificate, but the vaccination was three years expired. Well, the helpful folks told us not to worry becuase they happened to have some certificates they could sell us for only $20. When I pointed out that it would be a fake, they assured us that you did not need the actual vaccine just the certificate! We were a little skeptical so after some time decided to look for Internet access to search the requirements ourselves, we didn't get access but asked more poeple and the information seemed to be that citizens of tropical countries require the vaccine to enter, but as Canadians we would not need it.... So we hummed and hawed for far to long and eventually decided to just go and see of we could get it. Big surprise, got in no problem, no questions, no vaccine...and very glad not too had spent the $40 on fake certificates! It was close to noon at this point and we still had quite a little ride ahead of us, and needed to contact our host in San Gabriel, to give him our ETA. After a few tries we got in touch with him, and he told us it would be a good four hours of pedalling to get to his place...so we quickly hopped on the bikes, as usually people underestimate pedalling time. It turned out that the ride only took three hours, the best surprise ever! We connected with Edison, our host, and had an awesome evening with him, his wife Alexandra and their two awesome sons. Edison had advised us that the 90+ km ride to the next big town of Ibarra would be tough because it involved a big climb, head winds, and biting bugs .... It sounded, wonderful .... he suggested that we ride to Ambuqui where there was a Bombero station on the highway where we could probably camp. He also mentioned some hot springs along the way, but warned that the road downtown them would not be fun on a bike. When we got to the turn off to the hot springs we made the decision to try the road down, we asked a few locals and they said it should be just fine on a bike. Well, it was a narrow, cobbly windy road that went down down down into a deep canyon. About halfway down we could finally see our destination and made the decision to just carry on, and crawl our way back up in the afternoon. To our surprise there were not only hot springs at the bottom but also a giant cave that the river ran out of and had a church set up inside, it was pretty cool. Sadly the hot spring pools were looking pretty dirty, and I became paranoid that the tepid dirty water may be a breeding ground for infection...which also turned glenn off, so after all that no hot springs. We decided to try to get a ride with our bikes back to the highway, feeling very guilty about the prospect of cheating, but also not feeling like negotiating a couple hours of climbing steep cobblestones. So we found a truck that would bring us and hour bikes up for 25 cents, and we asked ourselves 'so...why are we biking, again?'. Well the gods seemed to conspire to not allow us to cheat very much, becuase about a third of the way up the hill we were stopped as a bus was stuck and tilting off the road ahead, blocking the entire road. We joined efforts with the 25+ people who were strapping ropes around the bus and pulling, and even attaching a rope to another truck and trying to pull that way. But, when a rope broke and everything seemed to be starting from scratch we decided that it might be faster to just ride up the rest of the way on our bikes, so we unloaded and carried on up the cobbly road. We shared our ride up with a very determined lady of maybe 70 years who clearly had to get up to the top of the road and was walking faster than we were biking up! A few hours later when we were back on the highway we saw some of the trucks and cars go by, so they somehow cleared the road... We had a glorious long downhill, which took us into a hot river valley where we found the town of Ambuqui and the bombero station. They took us in happily and we had a peaceful and restful night. We took off early expecting headwinds, biting bugs and difficult hills....luckily it was not too bad. There were biting bugs when we stopped, but no head wind! 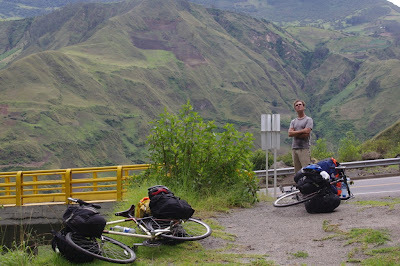 We climbed bit by bit and made it to Ibarra by lunch time... We neglected to bring many snacks for the ride so we were very hungry and I was very cranky, not a good combination when riding into a new city. But we found a place to eat and felt much better. The plan was to stay in Ibarra, but after doing some errands we were on the edge of the city so decided to ride out and look for a place on the way out of town. Unfortunately there was not very much in the way of hotels, the first place we stopped was out of our budget so we carried on. We got to the next little town and found two hotels, one way out of our budget and the other seemed overpriced for what it was. Frustrated and tired we decided to carry on some more. After much more climbing than we had expected we got to the town of Antonio Ante, and it turned out there was a bombero station there. We finally found it, it was getting dark at this point. We have become accustomed to firemen welcoming us in, or maybe calling their boss to ask, but normally there is not a problem. So, we were surprised when the fireman on duty responded to our request with 'but, why don't you just stay at a hotel? ', we felt a little silly explaining that the ones around were a little too expensive for us, and eventually he did agree saying that it is hard to find cheap hotels in this area. But, he did not think that us camping in the large flat backyard would be a good idea, because it might rain...we tried to explain that our tent was waterproof, to no avail. He then offered the storage closet, but then realized that if there was a call at night the firemen would need to rush in to get their supplies. Then he offered the upstairs fire safety education room- perfect we could set our tent up there! We went to buy some groceries in town and when we got back we asked where would be a good spot to set up our stove, explaining that it ran on gasoline and needed good ventilation; he thought for a minute and then brought glenn up to the fire safety room saying that would be a good spot. So, that night we cooked our dinner on a camp stove inside the non-ventilated fire safety room at the Fire Station....gotta wonder what the fire marshals in Canada might say? In the end this was a lovely place to stay, they even ended up offering us some bunks in one of the dormitories. With that out of the way we carried on to the little town of Cayambe, where we rested our wary bodies for the night and had confused dinner, in which the server did not understand our order and we ended up with many many plates of food and a very steep bill! The ride to Tumbaco was varied. We had lovely rolling hills, but more downhill than up for the first portion, then we turned off on a side road towards Tumbaco. After a short while we turned off on a rail trail (!) that Santiago who runs the casa ciclista had told us about. It was pretty fun, but very rough. We took it for about 15 km through tunnels and pushing our bikes over landslides, but with 45 kilos of gear and skinny tires, it was a tad challenging... So we turned back onto the highway, which at this point was very very busy and multiple lanes. What we did not know at the time was that we were riding on the main road to the new airport in Quito, that had opened that very day! We made it to Tumbaco by early afternoon, and Santiago came to bring us back to his home and the Tumbaco Casa Ciclista. Santiago has opened his home to cyclists for almost 20 years, and it is truly amazing that he and his family have been so kind and welcoming. However, he said that recently they decided to limit it to four guests at a time, he said that previously it was getting so popular that they would haves even or eight people here at all times! From here we will rest and look into the option of Spanish lessons nearby or in Quito centre.